In today’s confusing health insurance climate, it’s hard to know exactly how to shop for a policy. Some old options no longer exist, and new options are often unclear to consumers who don’t have time to become an expert in a highly complicated field. The Affordable Care Act has arrived with new rules that can be mystifying, along with a whole new vocabulary: marketplace policies, off-marketplace policies, subsidized premiums, mandates, ”Metal” plans...and the list goes on (and on!). Furthermore, those people thinking about buying a policy directly on the state marketplace may be surprised to learn that the navigators enlisted to help you are not allowed to offer advice and are not trained to save you money. Not only that, but they know nothing about insurance plans available off the marketplace—plans that may be more suitable to your insurance needs and your budget. Truly, it’s in your best interest not to go it alone, and also to not rely on people who can’t fully advise you about all choices available, including which policies would best fit your health care needs and save you money. Not all policies are the same, and not all consumers have the same needs. And who wants to pay more money for health insurance and health care than they have to? Look not only for an expert, but also for an expert who will work closely with you. You want to be assured that the person advising you on your important health care decisions is an expert. You want someone with experience, someone who understands how health insurance works, someone who is up-to-date on both changes in the laws and the details of the insurance plans he or she is presenting to you. You want someone who is available year-round, not just during enrollment periods. And you want someone who pays close attention to your individual situation and knows how best to connect what’s available with what you need. Look for a broker who is an agent for many insurance carriers. Look for a broker who is an agent for many insurance carriers. 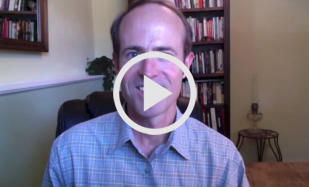 The more companies a broker represents, the more options that broker can offer you. While health care reform has mandated some standards, coverages and rates can still vary from insurance company to insurance company. And even when the coverages offered by Company A and Company B are the same, that doesn’t mean their rates will be. Therefore, look for a broker who represents many companies and can therefore find you not just the best policy benefits for your situation, but also the policy with the lowest premium. Then, if over time your premium goes up or your policy’s coverages change, your Personal Benefits Manager can access information on other options from any number of companies that may be better for you. Look for a broker whose specialty is health insurance. The one-stop shop for all your insurance needs (car, property, health, life) may sound appealing, but for many insurance companies and brokers, health insurance—which is far more complicated and personal than car or property insurance—is simply something they sell on the side. And they may only represent one or two health insurance carriers, therefore having access to a limited number of plans. To save money now as well as later, look for a specialist who knows all the ins and outs of specifically health insurance, and will be able to match your needs with a policy that offers the coverages and premiums that suit your situation. Look for a broker who offers a satisfaction guarantee. You’ll want to know in advance that if you decide you’re not pleased with your policy, you can get out of the transaction and get your money back. ColoHealth prides itself on living up to all these standards, and more. With decades of experience behind us, we know what works: Specialize in health insurance. Deliver the client personalized service from a highly trained, experienced and licensed Personal Benefits Manager�the same Personal Benefits Manager every time. Offer the client a wide variety of options. And guarantee that the client will be satisfied. We’re serious about that satisfaction. Take a look at our �No-Risk, Totally Thrilled, Money-Back Guarantee.” We’ll give you your money back and help you find insurance elsewhere if you’re not happy with the policy you purchase through ColoHealth. You might prefer to get started on your own by requesting an instant quote. However, if you’d be more comfortable talking with someone from the beginning, call us toll-free at 800-913-6381 or drop us a line through our contact page and we’ll get right back to you. ColoHealth puts service first; we won’t sell you a policy and disappear. When you first contact us, we’ll assign you a Personal Benefits Manager, a person you can call or email directly (no going through an automated menu, no getting a different person each time you need us). After you apply for a policy, your Personal Benefits Manager will see the transaction through to make sure your subsidies, if applicable, are processed, your premium is applied, and your policy is issued. But we don’t go away after that. Each year before renewal time, we conduct an Annual Comprehensive Policy Review so that you know your policy is still the right fit for your situation. If it’s not, we’ll help you find something better. And if you have questions for us during the year between the purchase of your policy and the annual review, we’ll still be here, ready to help. 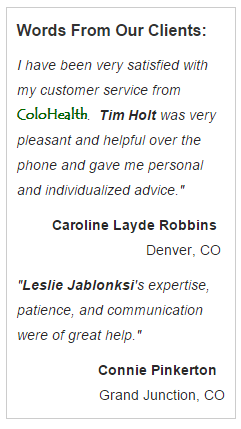 We would like the chance to prove that ColoHealth is indeed the right health insurance broker for you. Get to know more about us, then give us a call at 800-913-6381 or drop us a line. We’ll show you how hassle-free saving money on health insurance can be. ColoHealth is certified by Connect for Health Colorado, the Colorado marketplace.